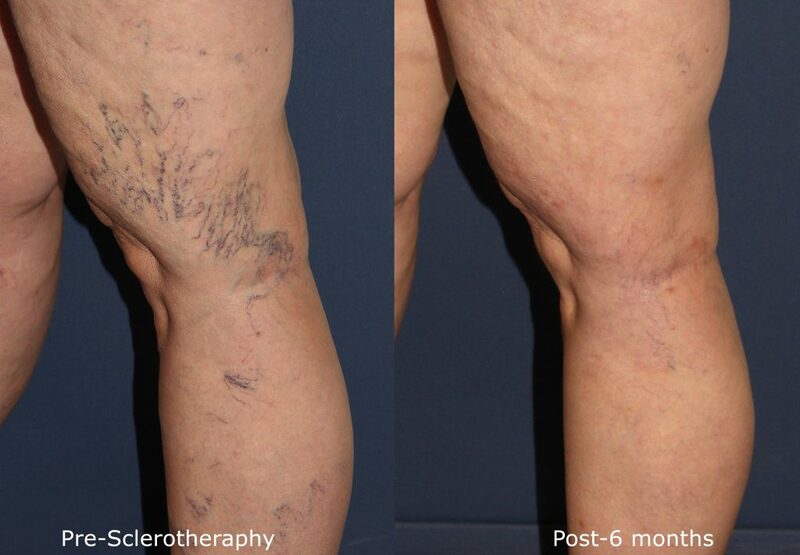 Sclerotherapy is a safe, effective way to eliminate unwanted spider or varicose veins, which can form on the legs. The procedure involves a series of injections into the vein with a sclerosing agent. 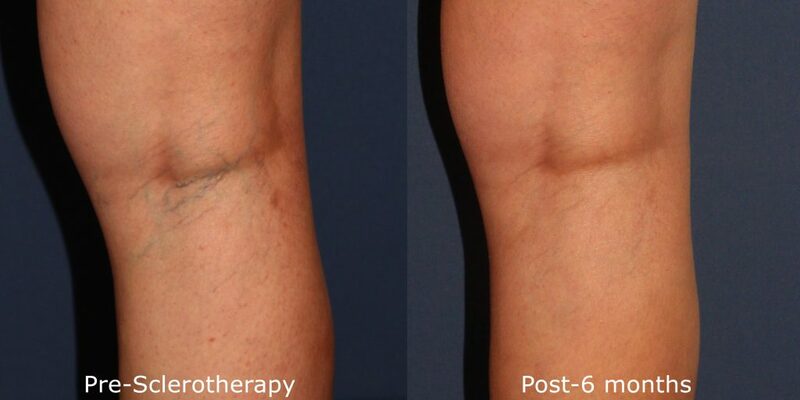 Through the skill and technique of our board-certified dermatologists, sclerotherapy safely and effectively cuts off the blood supply to the feeder vein. By wearing compression stockings, the blood supply remains cut off in the targeted vein, causing it to dissolve over a few weeks. At Cosmetic Laser Dermatology, we are proud to have several of the country’s leading experts in the treatment of visible, enlarged, or even painful spider or varicose veins. 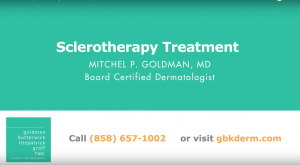 Our very own medical director Dr. Mitchel Goldman is a pioneer and leading authority in the field of veins and sclerotherapy treatments – he’s actually considered the godfather of sclerotherapy. He has founded and was President of the American College of Phlebology, national society of over 20,000 physicians who treat leg veins and has written and lectured extensively on these and related vascular topics, publishing multiple medical textbooks on the subject in 5 languages, some of which are now in their 6th edition. As leading experts in the latest dermatologic procedures, Cosmetic Laser Dermatology frequently conducts clinical trials to advance the field of cosmetic and laser dermatology treatments. Sclerotherapy is a safe, minimally invasive treatment option that helps eliminate unsightly spider or varicose veins, allowing you to feel comfortable wearing shorts, skirts, and other clothing that shows your legs. 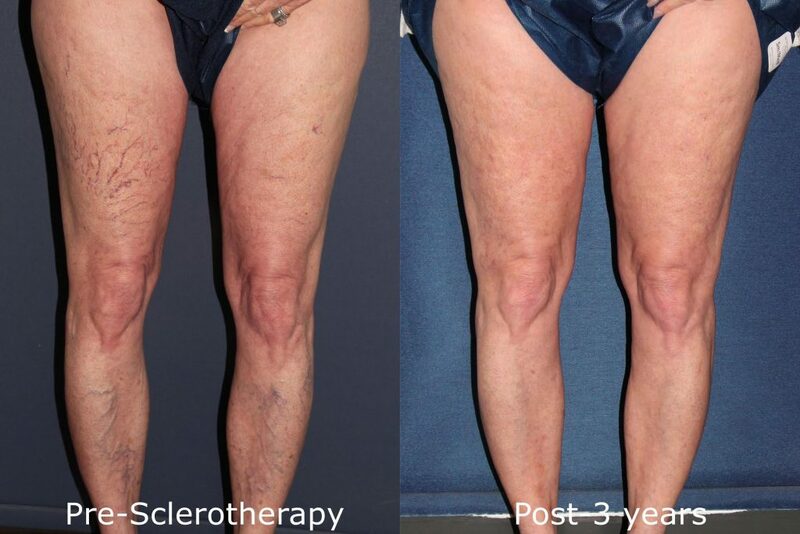 Furthermore, sclerotherapy does not cause many side effects. In some cases, patients may experience minor swelling, discoloration, and/or bruising, although these normally dissipate in 7-10 days. 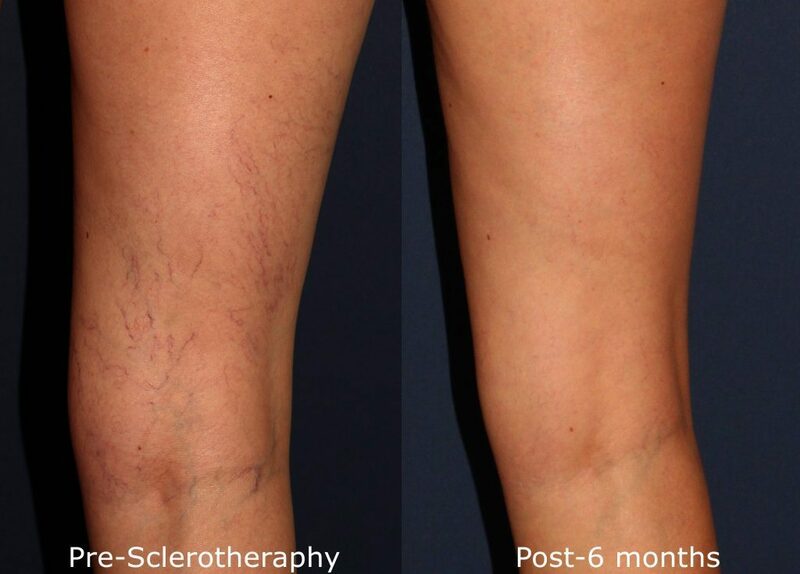 With sclerotherapy, you can have successful vein removal without surgery, anesthesia, or downtime. And because our vein reduction specialists perform the procedure themselves, you’ll be getting the best treatment and results possible. Contact Cosmetic Laser Dermatology today to learn more about this safe, effective procedure. Our vein specialists at Cosmetic Laser Dermatology have performed more successful sclerotherapy procedures than anyone else in the San Diego area. When you come to our skin care center, you’re in the hands of the foremost sclerotherapy experts anywhere who put your comfort and individual needs first. 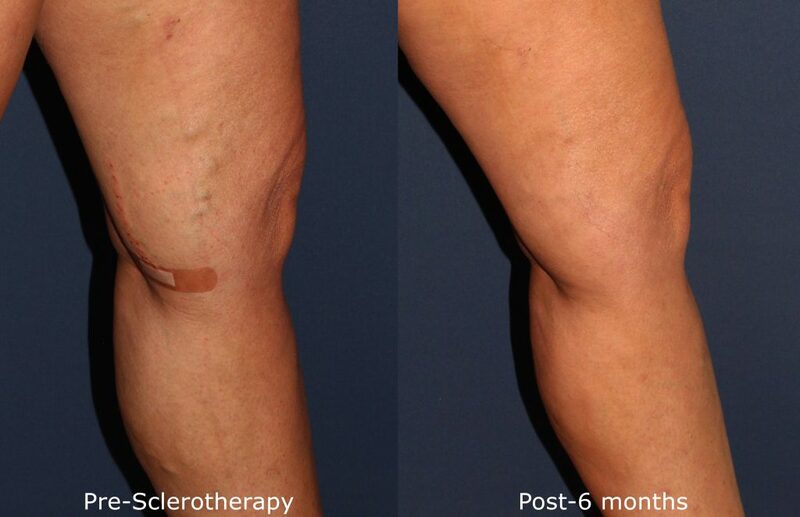 Sclerotherapy is a highly effective treatment, eliminating over 90% of an injected vein in a single session, which typically takes no more than 15 minutes. It is important to note that results vary and depend on each patient’s unique vein issues and overall health. In some cases, 2 – 3 sessions are recommended to achieve the best possible results. DO NOT STOP any prescribed medication unless your primary care doctor approves it. Sclerotherapy is administered with a tiny needle the size of a hair for optimal comfort. The number of sclerotherapy injections will depend on the treatment area as well as the type and severity of the vein issue. For hand veins, 1-4 injections may be administered on each hand, while more injections may be necessary for leg veins. You may notice tenderness, soreness, itching and mild discomfort near the injection site for a few days as well as hardening and darkening of the veins. This is normal, as it takes 4-8 weeks for the body to re-absorb the treated veins until they are no longer visible. Following leg vein treatments, properly fitted graduated compression stockings should be worn around the clock for the first week. This means 24/7, even while you shower. Two clinical studies that we published demonstrate that 7 days is ideal. The less time the stockings are worn the more likely the veins are to return and the more likely you are to develop pigmentation after treatment. To further enhance treatment results, you should continue to wear lighter graduated compression stockings while standing for an additional 2-3 weeks. Two weeks after your treatment you may notice a coagulum (a small collection of blood that is trapped within the vein but is NOT a blood clot). The coagulum may be tender and sore. If this happens, you should come into the office and have it drained by your physician, which will help relieve tenderness and soreness. Ibuprofen can be taken to help relieve inflammation. It generally can take 8-12 weeks to notice full improvement. Sometimes, additional treatment may be needed depending on how extensive the veins are. If so, we recommend that you wait 2-3 months before re-treating the same area. Please read our pre/post treatment guidelines for sclerotherapy and sclerotherapy for hands. To learn more about how we can help you overcome your problem veins, we encourage you to contact our team of experts today, as our warm, compassionate physicians will address your concerns and listen to aesthetic goals so that you can get the best, most customized treatment possible. To know more, visit ncbi.nlm.nih.gov/ or contact our body sculpting experts at Cosmetic Laser Dermatology. 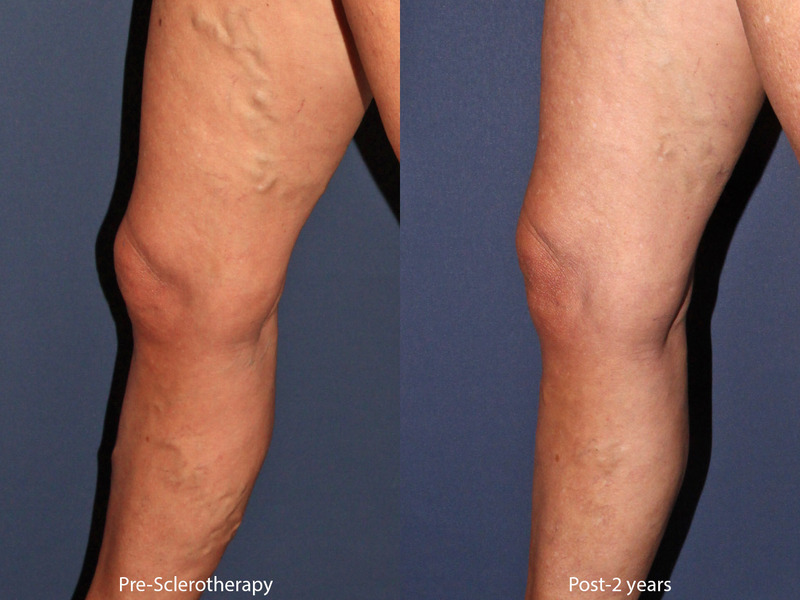 Dr. Wu performed sclerotherapy on this patient's leg veins. A: Yes, when performed by an expert injector, sclerotherapy is extremely safe. It’s very important to visit a board-certified dermatologist with extensive knowledge in vein removal treatments to ensure that you receive the safest and most effective treatments possible. Cosmetic Laser Dermatology is home to expert vein injectors who are board-certified dermatologists and diplomats of the American Board of Cosmetic Surgery. Q: Who should perform sclerotherapy injections? A: It’s crucial to visit a doctor who has been trained uniquely in sclerotherapy and has the versatile training and experience to provide the appropriate treatment for your unique needs. Dr. Mitchel P. Goldman, medical director of Cosmetic Laser Dermatology, is a pioneer of the treatment. This means that Dr. Goldman has the highest level of skill and knowledge when it comes to performing sclerotherapy treatments as well as phlebectomy, CTEV, and other vascular procedures. Unlike a vein clinic, each of the dermatologists at Cosmetic Laser Dermatology can expertly perform a range of safe, effective treatments for unsightly, problem veins and can create a custom treatment plan to achieve the results you are looking for. Q: When can I see results after my sclerotherapy injections? A: Though the results vary from person to person, it is possible to notice an improvement right away. In many cases, you’ll visibly see veins disappear in front of your eyes. However, over the course of the next several weeks, your veins will continue to resolve, therefore improving results. If you have additional questions about sclerotherapy, please contact us today! A: Varicose veins can develop for a number of reasons, including pregnancy, genetic factors, sun exposure, wearing high heeled shoes or due to age. These bulging veins can occur when the blood in the vessels begins to flow backward as a result of blocked passageways. 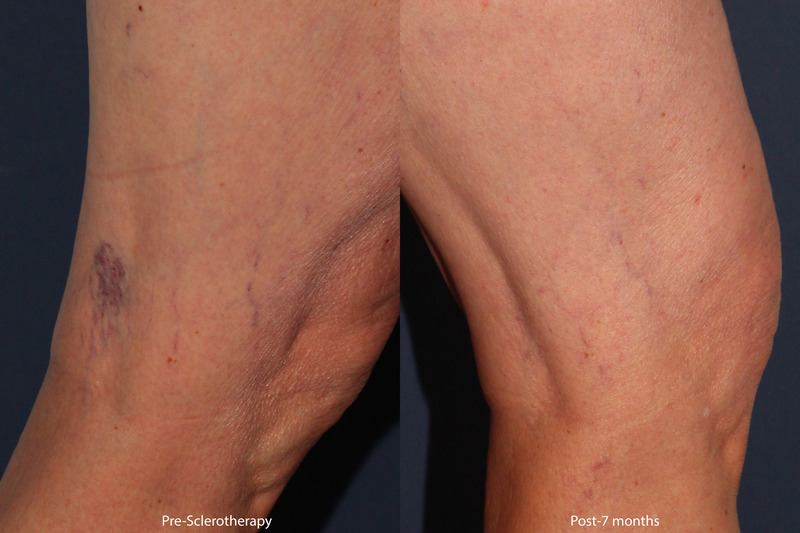 These veins can be safely removed without affecting blood flow in the treated area. In fact, removing damaged visible veins will result in an improved circulation. .
A: This depends on your specific situation. Sometimes, a person may require 2-3 treatments to see optimal results, though many will see excellent results after just one session. During your consultation, our doctors will be able to better address this question for you in person. Q: Is there any downtime following sclerotherapy in San Diego? A: There is very minimal downtime following sclerotherapy. You’re encouraged to walk and continue with normal activities, however, you must wear graduated compression stockings non-stop for the first week. After that, the stockings can be removed to shower. This helps ensure optimal results. Q: Are the compression socks needed for the best long-term results from sclerotherapy or mainly to manage the swelling or circulation? A: You should wear your compression stockings for 24 hours a day for 7 days, even in the shower and during sleep. Then just during the day for another week or two. It is important for you to wear the compression stockings because it will decrease any adverse effects and makes the procedure more effective. Q: Why would itching occur after sclerotherapy? How often does it occur in patients? A: Local itching at sites where sclerotherapy was performed can be common after the procedure. As the point of the procedure is to induce a local inflammatory reaction in the vessel, that can result in histamine release, which causes an itching sensation. This is typically why in our practice we apply a topical steroid to the legs immediately after sclerotherapy to mitigate this reaction. Although rare, if you are having itching beyond the areas of injection (rest of your body), you should notify your treating physician as this may be a sign of an allergic reaction, especially if it is accompanied by a rash. An allergic reaction is EXTREMELY rare and in fact has never occured in our practice in over 30 years with over 30,000 treatments. Q: Sclerotherapy was performed just days ago, and now I have a swollen leg and toes. Is this normal? A: After undergoing sclerotherapy treatment for leg veins, it’s very common to experience leg swelling, especially if you don’t continue wearing the compression garment and/or do not walk as advised. Typically, compression garments should be worn around the clock for the first several days. Not compression dressings but graduated compression stockings. If a compression dressing is not properly applied with the correct bandage, it can make things worse. Q: Is sclerotherapy recommended for tiny veins on the cheeks? A: While sclerotherapy is a very effective treatment for unwanted veins, facial veins are best treated with laser treatments. We offer multiple laser treatments in order to eliminate unwanted facial veins. Using IPL, Pulse Dye Laser, and CoolTouch Varia laser systems, facial veins are safely and effectively diminished. Q: How many weeks post-sclerotherapy is it advisable to do medium to high-intensity exercise? A: You should consult with your treating physician regarding their recommended protocol, as everyone’s may vary. Typically, we urge you to resume walking that same day and then resume medium to high-intensity workouts (avoiding as much abdominal recruitment) within 3 days of treatment. Of course, you should also wear compression hosiery 24 hours a day, 7 days a week after treatment (showering in them and blow drying them afterward). 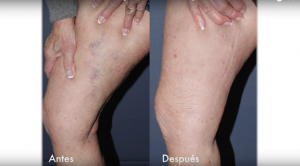 In addition to sclerotherapy, at Cosmetic Laser Dermatology, we can improve your veins with laser treatments or phlebectomy surgery (depending on the severity of your veins). To find out which procedure is more suitable for your condition, contact our team of cosmetic laser dermatologists to treat unsightly leg or hand veins so you can look and feel your best.